Practice question: how can I raise the subject of advance care planning? How can I broach the subject of advance care planning with families, when the person with dementia lacks capacity and is near the end of life? Advance care planning (ACP) is a structured discussion about a person’s wishes and thoughts for the future, and is recognised as a key part of good care at the end of life (Department of Health 2008, Royal College of Physicians et al 2009, General Medical Council 2010). 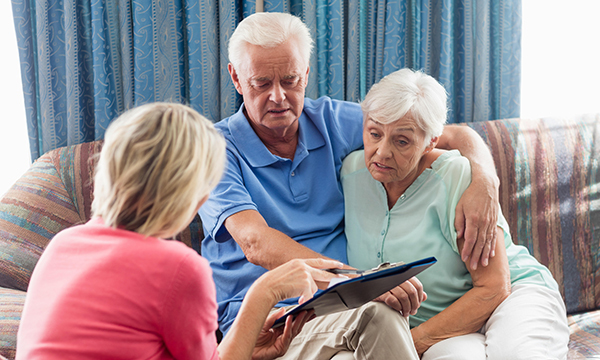 A national framework for local action (National Palliative and End of Life Care Partnership 2015) highlighted the importance of honest and sensitive conversations about dying to promote and encourage better end of life care planning. People with advancing dementia may have significant co-morbidities and life-limiting symptoms but may not have an advance care plan in place. This presents challenges for staff and families in making end of life care choices that help avoid crisis-driven decisions and inappropriate treatments. Although family members who know the person well may be in a good position to support ACP, discussions around end of life care can be difficult. Dementia is a terminal condition, but this may not have been communicated to families and may not be understood even at advanced stages (Andrews et al 2015). Carers may also find it difficult to engage in ACP because of conflicting family dynamics and a general unwillingness to make decisions about hypothetical future scenarios (Sampson et al 2010). Dening et al (2017) highlighted that families may have different views about end of life care to those of the person with dementia. They recommend carers require ongoing support and guidance, which includes exploring previous decision-making, the person with dementia’s wishes and carers’ need for support. Having conversations about ACP requires excellent communication, sensitivity and diplomacy. Clinicians need to establish a sound therapeutic relationship that can be sustained throughout the end stage of life (Costello 2017). A thorough understanding of the terminal symptoms of dementia is also crucial, so families are supported to recognise these. McGlade et al (2017) found that a targeted education programme called Let Me Decide led to improvements in staff’s ability to engage in difficult conversations around death and dying. Ensure staff have the appropriate skills, knowledge and confidence to have difficult conversations. Broach the subject sensitively and establish whether family members are aware of the terminal nature of dementia. Provide information about terminal symptoms of dementia, such as breathing abnormalities, eating problems and agitation. Involve the person with dementia where possible, even if capacity is limited, and try to establish previous wishes. Ensure jargon is explained and key phrases understood, including implications of active treatment, supportive measures and pain management. Be aware of any cultural or religious preferences that may influence decision-making. Discussing ACP with families, when the person with dementia lacks capacity and is near to the end of life, requires compassion, kindness and understanding by clinicians who have the appropriate skills and knowledge to guide carers through this potentially complex, yet vital planning. Andrews S, McInerney F, Toye C et al (2015) Knowledge of dementia; do family members understand dementia as a terminal condition? Dementia. 10.1177/1471301215605630. Costello J (2017) The role of informal caregivers at the end of life: providing support through advance care planning. International Journal of Palliative Nursing. 23, 2, 60-64. Dening KH, King M, Jones L et al (2017) Healthcare decision-making: past, present and future, in light of a diagnosis of dementia. International Journal of Palliative Nursing. 23, 1, 4-11. Department of Health (2008) End of Life Care Strategy: Promoting High Quality Care for All Adults at the End of Life. McGlade C, Daly E, McCarthy J et al (2017) Challenges in implementing an advance care planning programme in long-term care. Nursing Ethics. 24, 1, 87-99. National Palliative and End of Life Care Partnership (2015) Ambitions for Palliative and End of Life Care: A National Framework for Local Action 2015-2020. Royal College of Physicians, National Council for Palliative Care, British Society of Rehabilitation Medicine et al (2009) Advance Care Planning. Concise Guidance to Good Practice Series. No 12. RCP, London. Sampson E, Jones L, Thuné-Boyle I et al (2010) Palliative assessment and advance care planning in severe dementia: an exploratory randomized controlled trial of a complex intervention. Palliative Medicine. 25, 3, 197-209.